"How good and pleasant it is when brothers live together in unity", King David declares in Psalm 133:1. This brightly colored banner captures the very essence of this Holy Spirit-inspired statement! A circle of multi-colored figures, representing the different races and nations of the world, hold hands in a show of unity and solidarity. The light blue of the ocean represents the Holy Spirit, while the green color of the earth’s continents represents the new growth and life unity brings. The deep blue background represents the glory of God covering the earth. 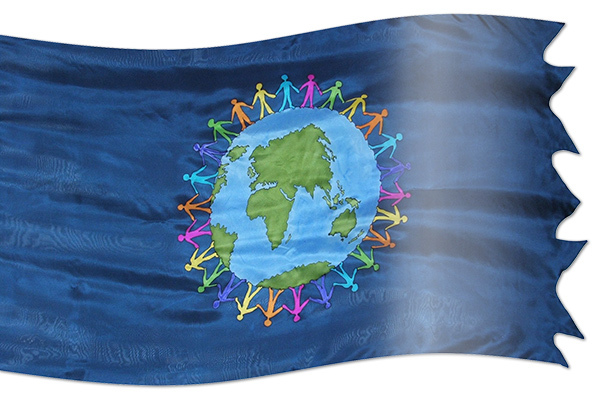 Use this banner to proclaim unity within the body of Christ, among churches, denominations, nations and races! Psalm 133:1 declares “how good and pleasant it is when brothers live together in unity”, while in Romans 12:16 we are commanded to “live in harmony with one another”. Jesus fervently prayed that his disciples would be “one”, just as He and the Father were one as a testimony to the world of Christ’s love (John 17:21-23). In Romans 12:4-5 we are told that although there are many members within the church, we all form one body. Unity, Church, Trinity, Jesus, God the Father, prayer, the nations, body. Blue: Authority, From Above (Exodus 24:10; 28:31; 39:22; Numbers 4:6; 15:38; 2 Chronicles 2:7; 3:14; Ezra 1:26; 10:1; John 14:26). God with Us, Holiness, Holy Spirit, Heaven, Our God Is a Holy God, Spiritual or Heavenly Realm, High and Lofty One (Exodus 24:10; Psalm 119:105). Purple: King of Kings and Lord of Lords, Kingship, Majesty, Royalty, Wealth (Song of Songs 3:10; John 19:2; Judges 8:26; Mark 15:17.